Stephen Arnold Music "Everywhere I Go"
Stephen Arnold Music, the World Leader in Sonic Branding®, has announced an expansion of its popular “Everywhere I Go” audio/video image campaign. Now, there is a fresh, new song for this comprehensive offering from Stephen Arnold Music that provides local stations with a cost-effective marketing toolkit focusing audiences on their multi-platform delivery of news and information. Now airing in more than 50 markets, the PromaxBDA Gold Award-winning “Everywhere I Go” was created to help local stations grow viewership and generate additional revenue. Rather than a typical promo that lists a stations’ digital offerings (online, mobile, social media, etc. 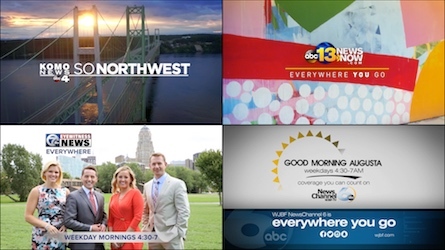 ), “Everywhere I Go” instead focuses on the audience perspective and the positive feelings that a station stirs by demonstrating that it’s ready with the latest, essential information -- on any device.